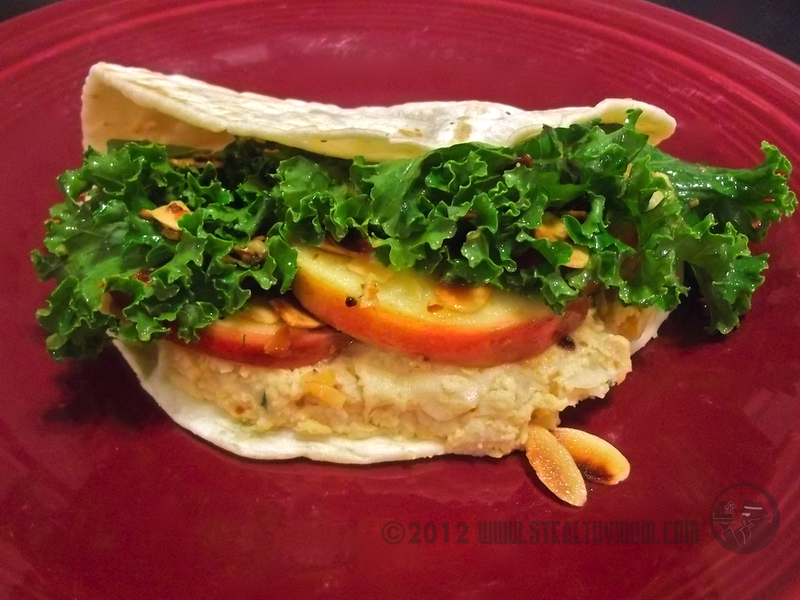 Sweet crunchy apples, salted almonds sautéed in olive oil, a hint of green onions, kale, and warm hummus all folded into a fresh flour tortilla. That's good. Really good, and I am hooked. Gently heat the olive oil in a pan. Add the green onion and almonds slices, stirring. As soon as the almonds brown, turn off the heat. Sprinkle with salt.Toss in the apple slices and kale to warm and coat with the oil. Spread hummus onto four medium-sized, soft tortillas. Add a quarter of the mixture from the pan. Fold over and enjoy. I shared this post with the Hearth and Soul Blog Hop. Your Groovy Garden Sandwich really does sound good! I love apples and almonds together, they are such a lovely flavour combination.